Sarah Cravey was born about 1780 in Edgecombe Co., North Carolina and died about 1860 in Decatur County, Georgia. Dates for birth and death are estimated. She lived to be about 80 years old. Some dates are estimated. She was baptized 7/31/1830. She is burred near Tired Creek Baptist Church Cemetery in Cairo, GA. She may have been a Creek Indian. Listed in District #22 on page 83A: J. Davis age 75, born in GA, Farmer; Sarah age 70, born in GA; and Ann age 50, born in GA. Listed as family #565: Joseph Davis (age 86, born in NC), Sarah (age 85), Ann P. (age 56, born in GA). No other information is provided. 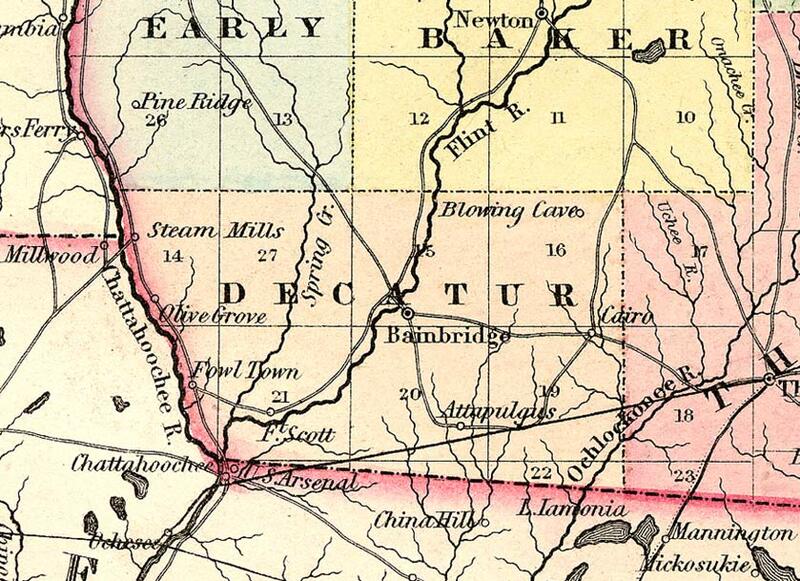 Additional information about Decatur County, GA around 1860: Map of Decatur County, GA created around 1855 -- five years before the 1860 Census. Click here to see a map from this timeperiod. 2 1782 The British evacuate Savannah on in July. 4 1784 Franklin and Washington Counties are formed. 5 1785 Burbon County formed. 6 1786 Greene County was created the same year Oglethorpe dies. 8 1788 Bourbon County Act rescinded. 9 1789 December 21 - Governor Telfair signs first Yazoo Act selling 20,000,000 acres of and for $207,000 or about one cent per acre to. The Yazoo Companies attempted to pay in worthless paper money and Georgia refuses to transfer the land. The Virginia Yazoo, headed by Patrick Henry, even had the unmitigated gall to attempt to pay in worthless Georgia paper money. The South Carolina Yazoo Company sues Georgia in the U.S. Supreme Court to compel delivery but the suit fails when Georgia is able to obtain ratification of the eleventh amendment to the U.S. Constitution on February 7, 1795. 10 1790 Alexander McGillivray, a mixed-blood of the Upper Creek Nation cedes the Altamaha lands to the Oconee. This treaty -- Treaty of New York -- is signed by President George Washington. 10 1790 Columbia and Elbert Counties are created. 13 1793 Hancock, Bryan, McIntosh, Montgomery, Oglethorpe and Warren Counties formed. This same year, the Fugitive Slave Act is passed. 14 1794 General Clarke surrenders ending the Oconee War. 15 1795 Governor Mathews signs the Second Yazoo Act selling somewhere between 35,000,000 and 50,000,000 acres of land for $500,000. 21 1801 Clarke and Tatnall Counties formed. 22 1802 Georgia formally cedes western claims for its southern boundary at the 31st parallel -- which will become a border between,GA, FL and AL. GA's western border reaches to the Mississippi River. 23 1803 Between 1803 and 1811 a horse trail is established connecting Milledgeville, Georgia to Fort Stoddert, American outpost north of Mobile. This is expanded into a road and called The Federal Road by 1811. 27 1807 December 10 - Jasper, Jones, Laurens, Morgan, Putnam, and Telfair Counties formed. 28 1808 Pulaski County created. 29 1809 Twiggs County formed. 31 1811 Tecumseh visits the Creek Indians living in what will become Georgia and Alabama to try to persuade them to join his fight against the flood of white settlers. Some towns join forces with Tecumseh and become known as "Red Sticks". 31 1811 Madison County created. 32 1812 Emanual County formed. 32 1812 The Creek tribes in southern Alabama and Georgia find themselves under increasing pressure from white settlers. Led by Chief Weatherford, they accepted an alliance with Tecumseh and are nicknamed "Red Sticks". 33 1813 During 1813-14, Muskogee-speaking Creeks leave GA and move into areas in Northern FL in response to the Creek Civil War (also known as the Red-sticks War). 37 1817 First Seminole war begins as Georgia backwoodsmen attack Indians just north of the Florida border. !817-1818. General Andrew Jackson invades the area. 39 1819 Rabun County formed. 40 1820 December 20 - Campbell and Randolph Counties formed. 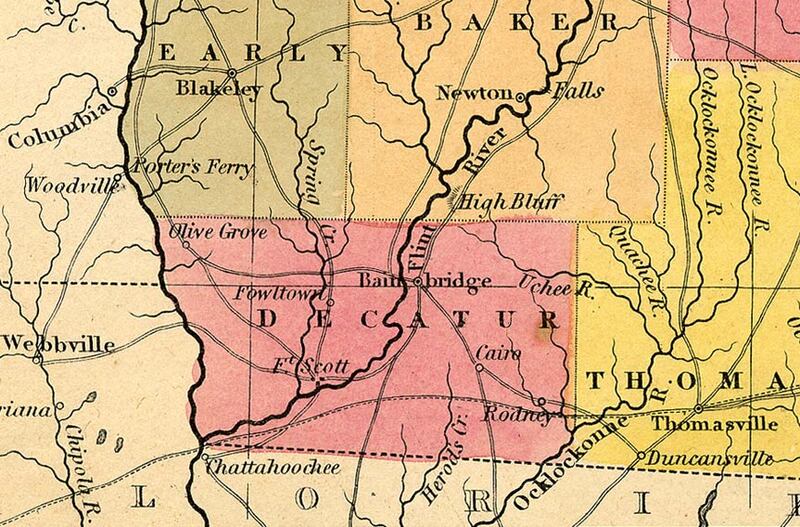 41 1821 May 15 - Dooly, Fayette, Henry, Houston, Monroe and Newton Counties formed. 42 1822 December 9 - Bibb, Dekalb and Pike Counties formed. 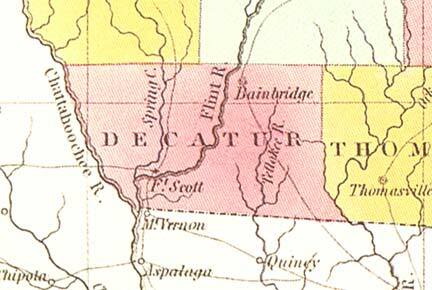 43 1823 December 8 - Decatur County formed. 44 1824 December 15 - Upson and Ware Counties formed. 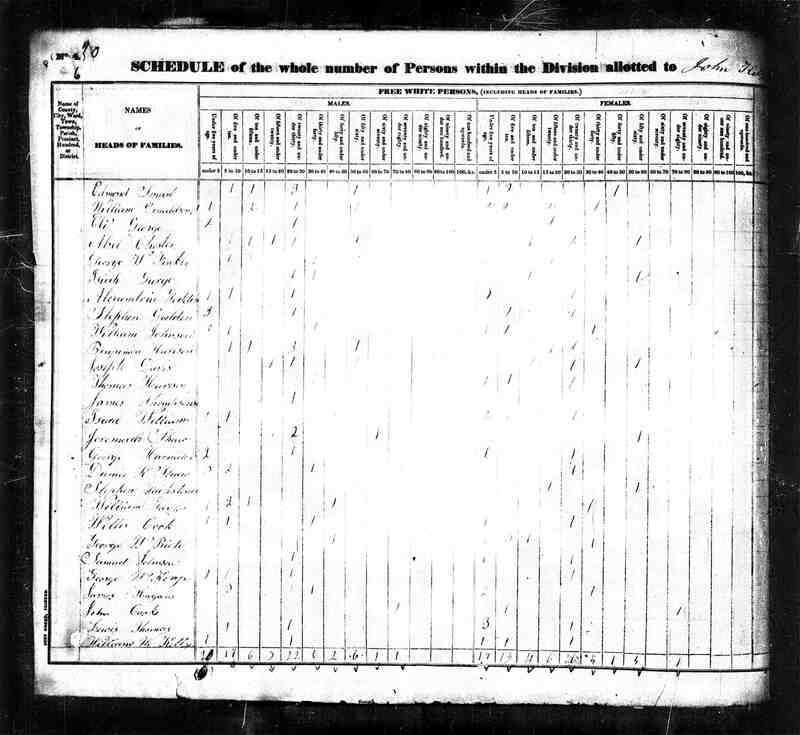 45 1825 Baker, Lowndes, Thomas, Butts and Taliaferro Counties formed. 46 1826 January 24 - Treaty of Washington abrogates Treaty of Indian Springs. The Creeks cede a smaller area and are allowed to remain on their lands until January 1, 1826. 47 1827 December 14, - Harris, Marion, Meriwether and Talbot. 50 1830 Cherokee, Heard, and Stewrt Counties are formed. 51 1831 Sumter County is formed. 52 1832 December 3 - Bartow, Cobb, Crawford, Floyd, Forsyth, Gilmer, Lumpkin, Murray, Paulding, and Union Counties formed. 53 1833 Walker County is formed. 56 1836 Seminoles massacre Major Francis L. Dade and his 103 man command. This starts the second Seminole War. February - Battle of Hitchity. March 27 - Colonel J.W. Fannin and his Georgian's executed by order of Santa Ana at Goliad on Palm Sunday. July - Battle of Brushy Creek. July 3 - Battle of Chickasawachee Swamp. July 27 - Battle of Echowanochaway Creek. 57 1837 Mcon and Dade Counties are formed. 70 1850 Gordon and Clinch Counties are formed. 71 1851 Clay, Howell, Polk, Spalding, and Whitfield Counties are formed. 72 1852 Taylor County formed. 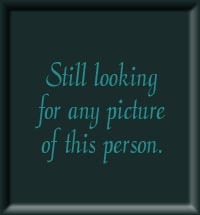 73 1853 Catoosa, Pickens, Hart, Dougherty, Webster, Flton, and Worth Counties aare creaated. 74 1854 Fannin, Coffee, Chattahooche, Charlton, and Calhoun Counties formed. 76 1856 Haralson, Terrell, Berrien, Colquit, Miller, and Towns Counties formed. 77 1857 Dawson, Milton, Pierce, Glascock, Mitchell, Schley, White, and Wilcox Counties formed. 78 1858 Clayton, Quitman, Banks, Brooks, Johnson, and Echols Counties formed. 9 1789 The capitol of North Carolina moves from New Bern to Raleigh and North Carolina becomes the 12th state of the United States of America. 50 1830 The U.S. Government begins forcing Cherokee Indians from their homes in what becomes known as the Trail of Tears. Many Cherokee hide in the mountains of North Carolina and surrounding states. Born about 1775 and died on an unknown day in August 1869. Born somewhere in Georgia about 1802 and died in Washington Co., Florida about 1870. He was about 68 years old. Ashley (1826-1897) who severed in the Civil War, CSA FL -1863. Born somewhere in Georgia about 1807 and died in Geneva County, Alabama about 1870. He was about 63 years old. Born somewhere in Georgia about 1808 and died somewhere in Georgia about 1840. He was about 32 years old. 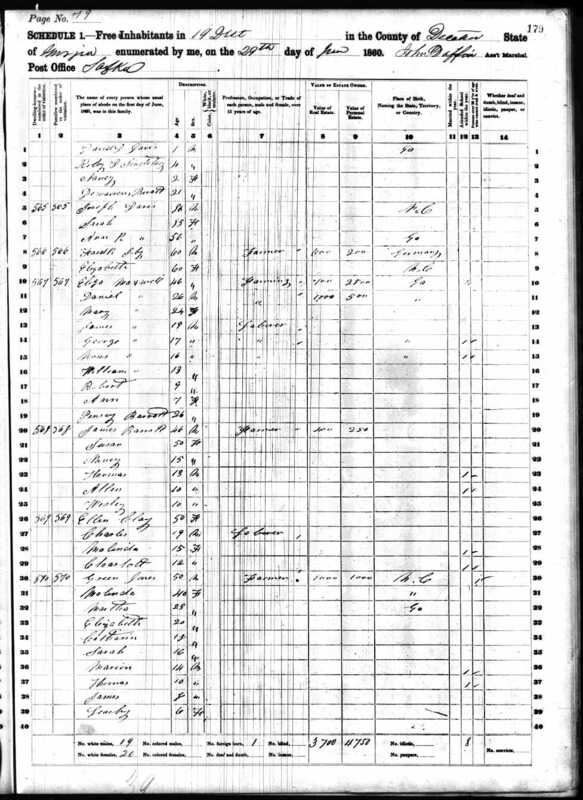 Born somewhere in Georgia on January 12, 1809 and died in Decatur County, Georgia on July 13, 1889. He was 80 years old. Jonas served in Capt. J. Hawthorn's GA Militia 1836-1838. He married Clarissa Prevatt (2/9/1822 -4/21/1911) Daughter of Thomas (1793) and Elizabeth Prevatt (1799). 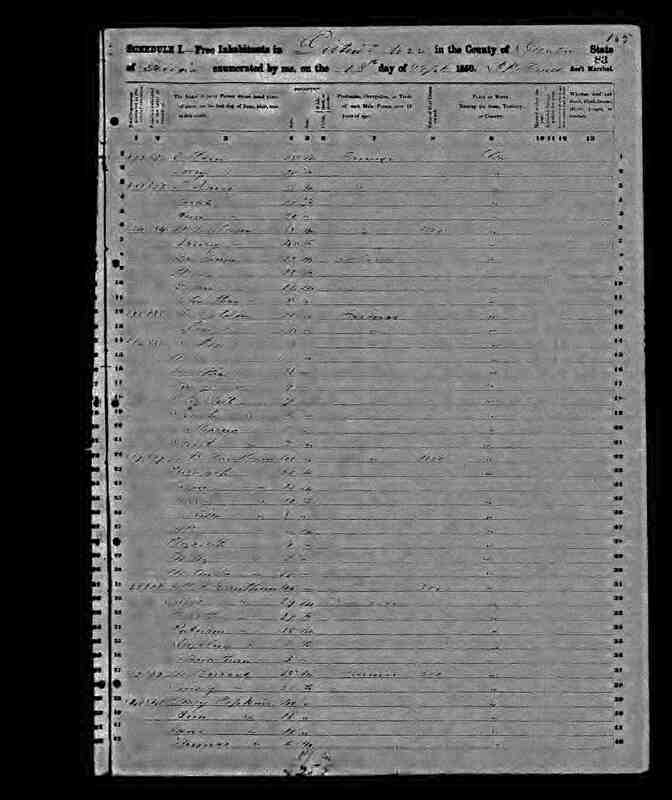 Born in Screven County, Georgia on April 6, 1812 and died in Grady County, Georgia on November 9, 1907. He was 95 years old. Born somewhere in Georgia on March 15, 1819 and died in Whigham , Decatur Co, Georgia on July 3, 1888. She was 69 years old.